Minimalism describes movements in various forms of art and design, especially visual art and music, where the work is stripped down to its most fundamental features. As a specific movement in the arts it is identified with developments in post-World War II Western Art, most strongly with American visual arts in the late 1960s and early 1970s. Prominent artists associated with this movement include Donald Judd, Carl Andre and Richard Serra. It is rooted in the reductive aspects of Modernism, and is often interpreted as a reaction against Expressionism and a bridge to Postmodern art practices. The term has expanded to encompass a movement in music which features repetition and iteration, as in the compositions of Steve Reich, Philip Glass, John Adams, and Terry Riley. (See also Post-Minimalism). The term "minimalist" is often applied colloquially to designate anything which is spare or stripped to its essentials. It has also been used to describe the plays of Samuel Beckett, the films of Robert Bresson, the stories of Raymond Carver, and even the automobile designs of Colin Chapman. In art music of the last 40 years, the term minimalism is sometimes applied to music which displays some or all of the following features: repetition (often of short musical phrases, with minimal variations over long periods of time, ostinati) or stasis (often in the form of drones and long tones); emphasis on consonant harmony; a steady pulse; hypnotic effect; sometimes use of phase shifting where sound waves gradually move out of sync with each other. Prime examples are the compositions of John Cage and LaMonte Young. The term minimalism, endowed independently by composer-critics Michael Nyman and Tom Johnson, has been controversial, but was in wide use by the mid-1970s. The application of a visual art term to music has been protested; however, not only do minimalist sculpture and music share a certain spare simplicity of means and an aversion to ornamental detail, but many of the early minimalist concerts happened in connection with exhibits of minimalist art by Sol LeWitt and others. Several composers associated with minimalism have disavowed the term, notably Philip Glass, who has reportedly said, "That word should be stamped out!!" A more recent form of minimalistic music is Minimal techno, a sub-genre of Techno music. In its most basic form it can consist of little more that a single ostinato motif (often called a loop) played in common time with a bass drum sounding on the quarter note pulse. In other examples basic rhythm patterns are layered to create polyrhythmic accompaniment to the same 4/4 bass drum pulse. Sherburne (2004) calls the latter technique massification and the former skeletalism. The term minimalism is also used to describe a trend in design and architecture where in the subject is reduced to its necessary elements. Minimalist design has been highly influenced by Japanese traditional design and architecture. In addition, the work of De Stijl artists is a major source of reference for this kind of work. De Stijl expanded the ideas that could be expressed by using basic elements such as lines and planes organized in very particular manners. Architect Ludwig Mies van der Rohe adopted the motto "Less is more" to describe his aesthetic tactic of arranging the numerous necessary components of a building to create an impression of extreme simplicity, by enlisting every element and detail to serve multiple visual and functional purposes (such as designing a floor to also serve as the radiator, or a massive fireplace to also house the bathroom). Designer Buckminster Fuller adopted the engineer's goal of "Doing more with less", but his concerns were oriented towards technology and engineering rather than aesthetics. A similar sentiment was industrial designer Dieter Rams' motto, "Less but better", adapted from van der Rohe. The structure uses relatively simple elegant designs. The structure's beauty is also determined by playing with lighting, using the basic geometric shapes as outlines, using only a single shape or a small number of like shapes for components for design unity, using tasteful non-fussy bright color combinations, usually natural textures and colors, and clean and fine finishes. Using sometimes the beauty of natural patterns on stone and wood encapsulated within ordered simplified structures. May use color brightness balance and contrast between surface colors to improve visual aesthetics. The structure would usually have industrial and space age style utilities (lamps, stoves, stairs, etcetera), neat and straight components (like walls or stairs) that appear to be machined with machines, flat or nearly flat roofs, pleasing negative spaces, and large windows. This and science fiction may have contributed to the late twentieth century futuristic architecture design, and modern home decor. Modern minimalist home architecture with its unnecessary internal walls removed may have led to the popularity of the open plan kitchen and living room style. Another modern master who exemplifies reductivist ideas is Luis Barragan. In minimalism, the architectural designers pay special attention to the connection between perfect planes, elegant lighting, and careful consideration of the void spaces left by the removal of three-dimensional shapes from an architectural design. The more attractive looking minimalist home designs are not truly minimalist, because these use more expensive building materials and finishes, and are relatively larger. Contemporary architects working in this tradition include John Pawson, Eduardo Souto de Moura, Alvaro Siza, Tadao Ando, Alberto Campo Baeza,Yoshio Taniguchi, Peter Zumthor, Hugh Newell Jacobsen, Vincent Van Duysen, Claudio Silvestrin, Michael Gabellini, and Richard Gluckman. Minimalism in visual art, generally referred to as "minimal art", literalist art and ABC Art emerged in New York in the early 1960s. Initially minimal art appeared in New York in the 60s as new and older artists moved toward geometric abstraction; exploring via painting in the cases of Frank Stella, Kenneth Noland, Al Held, Ellsworth Kelly, Robert Ryman and others; and sculpture in the works of various artists including David Smith, Anthony Caro, Tony Smith, Sol LeWitt, Carl Andre, Dan Flavin, Donald Judd and others. Judd's sculpture was showcased in 1964 at the Green Gallery in Manhattan as were Flavin's first fluorescent light works, while other leading Manhattan galleries like the Leo Castelli Gallery and the Pace Gallery also began to showcase artists focused on geometric abstraction. In addition there were two seminal and influential museum exhibitions: Primary Structures: Younger American and British Sculpture' shown from April 27 - June 12, 1966 at the Jewish Museum in New York, organized by the museum's Curator of Painting and Sculpture, Kynaston McShine and Systemic Painting, at the Solomon R. Guggenheim Museum curated by Lawrence Alloway also in 1966 that showcased Geometric abstraction in the American art world via Shaped canvas, Color Field, and Hard-edge painting. 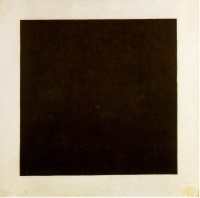 In the wake of those exhibitions and a few others the art movement called minimal art emerged. In a more broad and general sense, one finds European roots of minimalism in the geometric abstractions of painters associated with the Bauhaus, in the works of Kazimir Malevich, Piet Mondrian and other artists associated with the De Stijl movement, and the Russian Constructivist movement, and in the work of the Romanian sculptor Constantin Brâncuşi. Minimal art is also inspired in part by the paintings of Barnett Newman, Ad Reinhardt, Josef Albers, and the works of artists as diverse as Pablo Picasso, Marcel Duchamp, Giorgio Morandi, and others. Minimalism was also a reaction against the painterly subjectivity of Abstract Expressionism that had been dominant in the New York School during the 1940s and 1950s. There have been some further constructions of what I wrote that go over into preposterousness: That I regard flatness and the inclosing of flatness not just as the limiting conditions of pictorial art, but as criteria of aesthetic quality in pictorial art; that the further a work advances the self-definition of an art, the better that work is bound to be. The philosopher or art historian who can envision me -- or anyone at all -- arriving at aesthetic judgments in this way reads shockingly more into himself or herself than into my article. In contrast to the previous decade's more subjective Abstract Expressionists, with the exceptions of Barnett Newman and Ad Reinhardt; minimalists were also influenced by composers John Cage and LaMonte Young, poet William Carlos Williams, and the landscape architect Frederick Law Olmsted. They very explicitly stated that their art was not about self-expression, unlike the previous decade's more subjective philosophy about art making theirs was 'objective'. In general, Minimalism's features included geometric, often cubic forms purged of much metaphor, equality of parts, repetition, neutral surfaces, and industrial materials. Robert Morris, an influential theorist and artist, wrote a three part essay, "Notes on Sculpture 1-3", originally published across three issues of Artforum in 1966. In these essays, Morris attempted to define a conceptual framework and formal elements for himself and one that would embrace the practices of his contemporaries. These essays paid great attention to the idea of the gestalt - "parts... bound together in such a way that they create a maximum resistance to perceptual separation." Morris later described an art represented by a "marked lateral spread and no regularized units or symmetrical intervals..." in "Notes on Sculpture 4: Beyond Objects", originally published in Artforum, 1969, continuing to say that "indeterminacy of arrangement of parts is a literal aspect of the physical existence of the thing." The general shift in theory of which this essay is an expression suggests the transitions into what would later be referred to as postminimalism. One of the first artists specifically associated with minimalism was the painter, Frank Stella, whose early "pinstripe" paintings were included in the 1959 show, 16 Americans, organized by Dorothy Miller at the Museum of Modern Art in New York. The width of the stripes in Frank Stellas's pinstripe paintings were determined by the dimensions of the lumber used for stretchers, visible as the depth of the painting when viewed from the side, used to construct the supportive chassis upon which the canvas was stretched. The decisions about structures on the front surface of the canvas were therefore not entirely subjective, but pre-conditioned by a "given" feature of the physical construction of the support. In the show catalog, Carl Andre noted, "Art excludes the unnecessary. Frank Stella has found it necessary to paint stripes. There is nothing else in his painting." These reductive works were in sharp contrast to the energy-filled and apparently highly subjective and emotionally-charged paintings of Willem de Kooning or Franz Kline and, in terms of precedent among the previous generation of abstract expressionists, leaned more toward the less gestural, often somber, color field paintings of Barnett Newman and Mark Rothko. Although Stella received immediate attention from the MoMA show, artists including Kenneth Noland, Gene Davis, Robert Motherwell and Robert Ryman had also begun to explore stripes, monochromatic and Hard-edge formats from the late 50s through the 1960s. Because of a tendency in minimal art to exclude the pictorial, illusionistic and fictive in favor of the literal, there was a movement away from painterly and toward sculptural concerns. Donald Judd had started as a painter, and ended as a creator of objects. His seminal essay, "Specific Objects" (published in Arts Yearbook 8, 1965), was a touchstone of theory for the formation of minimalist aesthetics. In this essay, Judd found a starting point for a new territory for American art, and a simultaneous rejection of residual inherited European artistic values. He pointed to evidence of this development in the works of an array of artists active in New York at the time, including Jasper Johns, Dan Flavin and Lee Bontecou. Of "preliminary" importance for Judd was the work of George Earl Ortman, who had concretized and distilled painting's forms into blunt, tough, philosophically charged geometries. These Specific Objects inhabited a space not then comfortably classifiable as either painting or sculpture. That the categorical identity of such objects was itself in question, and that they avoided easy association with well-worn and over-familiar conventions, was a part of their value for Judd. This movement was heavily criticised by modernist formalist art critics and historians. Some critics thought minimal art represented a misunderstanding of the modern dialectic of painting and sculpture as defined by critic Clement Greenberg, arguably the dominant American critic of painting in the period leading up to the 1960s. The most notable critique of minimalism was produced by Michael Fried, a formalist critic, who objected to the work on the basis of its "theatricality". In Art and Objecthood (published in Artforum in June 1967) he declared that the minimal work of art, particularly minimal sculpture, was based on an engagement with the physicality of the spectator. He argued that work like Robert Morris's transformed the act of viewing into a type of spectacle, in which the artifice of the act observation and the viewer's participation in the work were unveiled. Fried saw this displacement of the viewer's experience from an aesthetic engagement within, to an event outside of the artwork as a failure of minimal art. Fried's essay was immediately challenged by postminimalist and earth artist Robert Smithson in a letter to the editor in the October issue of Artforum. Smithson stated the following: "What Fried fears most is the consciousness of what he is doing--namely being himself theatrical." In addition to the already mentioned Robert Morris, Frank Stella, Carl Andre, Robert Ryman and Donald Judd other minimal artists include: Robert Mangold, Larry Bell, Dan Flavin, Sol LeWitt, Brice Marden, Agnes Martin, Jo Baer, John McCracken, Ad Reinhardt, Fred Sandback, Richard Serra, Tony Smith, Patricia Johanson, Blinky Palermo and Anne Truitt. "When I brought Hofmann up to meet Pollock and see his work which was before we moved here, Hofmann’s reaction was — one of the questions he asked Jackson was, do you work from nature? There were no still lifes around or models around and Jackson’s answer was, I am nature. And Hofmann’s reply was, Ah, but if you work by heart, you will repeat yourself. To which Jackson did not reply at all." The meeting between Pollock and Hofmann took place in 1942. Literary minimalism is characterized by an economy with words and a focus on surface description. Minimalist authors eschew adverbs and prefer allowing context to dictate meaning. Readers are expected to take an active role in the creation of a story, to "choose sides" based on oblique hints and innuendo, rather than reacting to directions from the author. The characters in minimalist stories and novels tend to be unexceptional; they may be pool supply salespeople or second tier athletic coaches rather than famous detectives or the fabulously wealthy. Some 1940s-era crime fiction of writers such as James M. Cain and Jim Thompson adopted a stripped-down, matter-of-fact prose style to considerable effect; some classifiy this prose style as minimalism. Another strand of literary minimalism arose in response to the meta-fiction trend of the 1960s and early 1970s (John Barth, Robert Coover, and William H. Gass). These writers were also spare with prose and kept a psychological distance from their subject matter. Minimalist authors, or those who are identified with minimalism during certain periods of their writing careers, include the following: Raymond Carver, Chuck Palahniuk, Bret Easton Ellis, Ernest Hemingway, K.J. Stevens, Amy Hempel, Bobbie Ann Mason, Tobias Wolff, Grace Paley, Sandra Cisneros, Mary Robison, Frederick Barthelme, Richard Ford, David Foster Wallace and Alicia Erian. American poets such as William Carlos Williams, early Ezra Pound, Robert Creeley, Robert Grenier, and Aram Saroyan are sometimes identified with their minimalist style. The term "minimalism" is also sometimes associated with the briefest of poetic genres, haiku, which originated in Japan but has been domesticated in English literature by poets such as Nick Virgilio, Raymond Roseliep, and George Swede. The Irish author Samuel Beckett is also known for his minimalist plays and prose. Unless indicated otherwise, the text in this article is either based on Wikipedia article "Minimalism" or another language Wikipedia page thereof used under the terms of the GNU Free Documentation License; or on original research by Jahsonic and friends. See Art and Popular Culture's copyright notice. This page was last modified 21:46, 16 October 2013.